I love steamed rice, plain steamed rice. We treat it like fast food in our house. Until recently, if all else failed, steamed basmati rice topped with a dollop of natural yoghurt would have more than adequately sated our appetites, then we tried a few of the quick rice dishes from “Fresh India” by Meera Sodha. Plain rice seems just a bit ho hum now. This fab rice dish will take 30 minutes from start to finish and requires next to no effort at all. While the rice is steaming prepare the remaining ingredients then, when you turn the heat off under the rice, begin to saute the whole spices. From that point on dinner is just five minutes away. While we love this rice alone, or with a little raita, it’s also a great side dish for curries made with seafood. I have altered the original recipe a little so it complies with my onion free diet but there is no compromise when it comes to flavour. It’s delicious hot or cold. Heat the oil in a large pan over a medium heat the saute the spices until they sizzle and pop. Add the curry leaves, peanuts and chilli and stir fry for a few minutes. Add the ginger and saute until it’s translucent. Tip the rice into the pan, add the remaining ingredients then gently toss to thoroughly combine. I’m so happy to have found your site. All your recipes look delicious, and I am sure going to try some soon! I love it when rice is the star of the show because I adore it. This is a fabulous recipe – great flavours and spices but I particularly like the addition of peanuts. Think I could polish off that whole bowl! What a photo, love it. As for the rice, I am super lazy with rice sometimes but you have given me a ‘kick up the rice hiney’ and I shall give this a whirl. So good, Sandra! I love that book. This recipe set my taste buds tingling… until I registered “curry leaves”?!!! Never heard of them before this, so now I have an excuse to find an Indian market and explore. Your pot is show-stoppingly gorgeous. Hi Dee, curry leaves have a distinctive flavour and there is really no substitute but many souther Indian dishes rely on them for flavour so if you’re able to find them fresh, keep a stash in the freezer. They are esp delicious with vegetables. Wow I love this. I make similar dishes, but reverse the method. I start with the spices, and uncooked rice, fry until lightly toasted and then add boiling water and steam. I’ll try your method to see which one I like best. I do know I’ll love both! Yes it is a bit opposite to a traditional pilau but no less delicious..
Lovely post Sandra. the dish is excellent (as is the bowl). I always wondered how different boiled rice and steamed rice would taste – or is it just a texture thing? The curry flavours here sound wonderful. We experiment with various spicy. 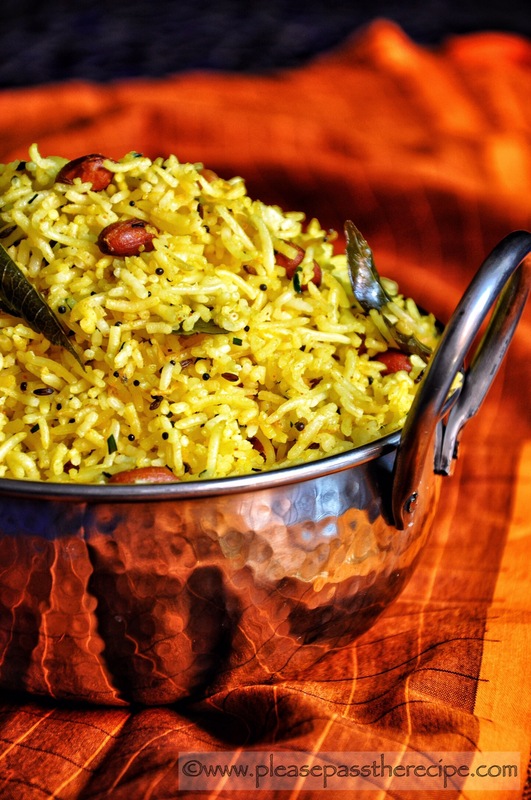 nutty, dried fruity additions to our rice pilaf recipes. Will add a curry one to the list. Ooh, this one has me drooling just reading it. Yum! You’ve inspired me to make something rice-y for my supper, and no surprise, some curry flavours in it. I don’t keep as wide a selection of spices as you, but it’s not bad! This entry was posted on November 16, 2017 by ladyredspecs in Cooking, Dairy Free, FODMAP diet, Food, Gluten Free, Indian Food, Light Savoury Dishes, Main Meals, recipes, Side Dishes & Salads, Vegan, Vegetarian and tagged curry leaves, Fodmap, FODMAP diet, gluten free, indian, lemon, peanuts, rice, vegan, vegetarian.